TAIPEI (Reuters) - Vowing that "no one can obliterate Taiwan's existence," President Tsai Ing-wen left on Sunday for the United States and two of Taipei's remaining diplomatic allies, amid pressure from China to try to stamp out references to the island internationally. Also, China has also been whittling down the number of countries that recognise Taiwan - now just 18 - with Burkina Faso and the Dominican Republic switching relations to Beijing this year. 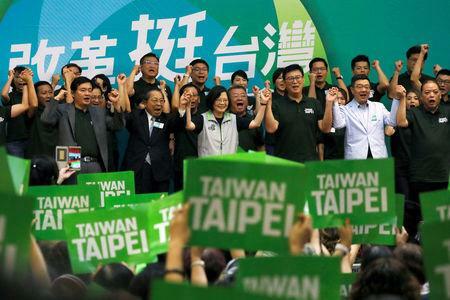 Speaking before her flight to Los Angeles, where she was stopping en route to Belize and Paraguay, Tsai struck a defiant tone. "In going abroad, the whole world can see Taiwan; they can see our country as well as our support for democracy and freedom," Tsai said. "We only need to be firm so that no one can obliterate Taiwan's existence." Tsai arrived in Los Angeles on Sunday and was scheduled to address a banquet for Taiwanese-Americans there on Sunday evening, then pay a visit to the Ronald Reagan Presidential Library outside of Los Angeles on Monday, according to Phi Lin Chuang, a Taiwanese government spokeswoman. China, which believes Tsai wants to push for Taiwan's formal independence, has already complained to Washington about her U.S. stopovers, which include Houston on her way back. The trip starts one day after Taiwan's state-run refiner CPC Corp announced a deal valued at $25 billion to purchase liquefied natural gas from the United States over the next 25 years. The deal was aimed at boosting trade relations with the United States by reducing its trade surplus and was also a sign of goodwill ahead of Tsai's visit, a person familiar with the government's thinking told Reuters. She will also meet with business representatives to discuss how Taiwan could drum up investment and procurement with the United States, they said. Washington has no formal ties with Taiwan but is the island's strongest ally and sole foreign arms supplier. Tsai's U.S. stopovers come as China and the United States are engaged in a trade war, adding to Beijing's irritation with Washington.